Jeddah Economic Co., co-founded by billionaire Prince Alwaleed Bin Talal’s Kingdom Holding Co., is forming an 8.4 billion-riyal ($2.2 billion) real estate development fund with Saudi Arabia’s Alinma Bank. 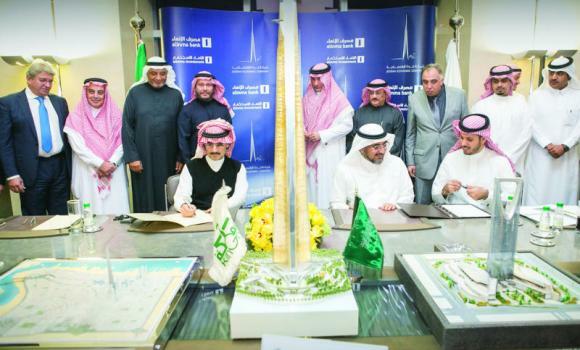 The fund will help develop the Jeddah Economic City project, construction work on Jeddah Tower and other real estate projects, Kingdom Holding said Sunday in a statement. Alinma Bank will finance the fund, which is to be managed by Alinma Investment, while Jeddah Economic Co. will be the developer of projects that will draw on the fund’s credit lines. Alwaleed will chair the fund’s board, with Alinma Chief Executive Officer AbdulMohsen Alfaris as deputy chairman. Jeddah Economic Co. is developing the Kingdom City, Jeddah project which will feature a kilometer-high (0.62 mile-high) skyscraper on the Red Sea coast.